From the day we have entered in this industry, we have brought forth an inclusive gamut of HDPE Rope. The material used in their fabrication process is acquired from specialized sellers of the industry after stern quality checkups. To add, these are well packed to retain their safety prior shipment. We have carved a niche amongst the most trusted names in this business, engaged in offering a comprehensive range of HDPE Semi Rope. We offer an unmatchable range of HDPE Rope that is made utilizing high grade HDPE. The range is used in different sectors and for various household purposes. We offer the range in varied attractive hues. Not just this, we also undertake the responsibility of bulk orders as per the requirements of our clients. 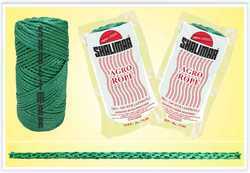 We offer best quality HDPE monofilament ropes and PP monofilament ropes of 3 strand only. We offer an extensive range HDPE Rope that are acknowledged for their durability and posses low maintenance cost. These leads provides fine grip and are available in various colors, patterns and designs. To attain complete client satisfaction, we offer these in customized specifications and at industry leading prices. 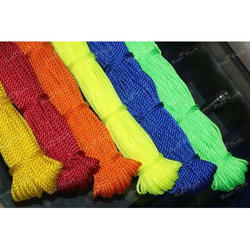 Our company is providing a broad assortment of HDPE Ropes. These products are appreciated in the marketplace for their finest quality, design and lasting nature. Z .A. Goawala And Co.
We specialize in manufacturing and exporting HDPE Ropes in 3 & 4 strand of upto 32 mm in diameter and Bale Twines of upto 100000 D. The entire production is being exported to Middle East, Gulf and African countries.